The new Sun Belt Conference basketball scheduling has gotten rid of teams playing doubleheaders this season. Instead of both the men’s and women’s teams playing the same school in the same arena on the same day, they will now have one team play at home and the other team will play away against the same school on the same day. They will still compete against the same teams, but in different arenas. This is all part of the Sun Belt Conference “20-game smart schedule” for the 2019-2020 season for men’s basketball. They will split it into two divisions: east and west. Each team will have five home and away games against their division rivals and three home and away games against their non-divisions teams. Women’s basketball teams in the Sun Belt will continue to play an 18-game conference schedule like they did last season. How does this change men’s basketball? Questions have been asked on whether this could be good or bad for various reasons that include attendance, routines and other types of preparation before the games. These questions became valid after seeing a shortage of attendance for women’s basketball this season. 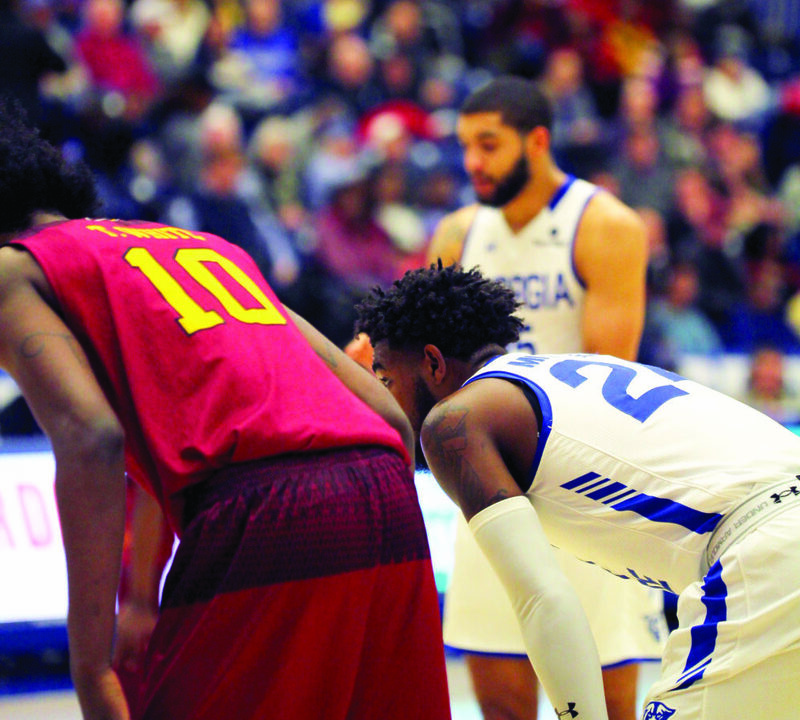 Third year assistant coach for men’s basketball Ray McCallum believes that it is advantages and disadvantages for how the team prepares before playing their opponent. “We know on a Thursday night game, we will have a routine,” McCallum said. “It puts the guys in the preparation routine that helps with it being consistent. While some believe there are ups and downs to this new scheduling system, senior guard Devin Mitchell isn’t affected much. Mitchell also agreed, partially, that it may have some effect on the women’s games attendance during the season now that there are no more doubleheaders. “A lot of people used to stay over from the women’s games and watch our games,” Mitchell said. Head coach Ron Hunter, who has been coach for the Panthers for seven seasons, believes that whether it is men’s or women’s basketball, people will come out and support winning programs. With the men’s team having more time for preparation before tip-off, it seems that everything is a bit better for them. How’s is women’s basketball affected? Head coach Gene Hill believes it may have affected attendance at other schools, but not here at Georgia State. Senior forward, KK Williams, agreed with Hill about the support of the fans being helpful. Last season, they had an average home attendance record of 427 people against their nine conference opponents. Their 71-56 win against Georgia Southern was the game with the most people in attendance. In the two home conference games they have played this season, they have an average of 363 people in attendance. The change is an 15 percent decrease in conference attendance, but more representative numbers will be available when the Panthers play their seven remaining home games. The game with the most spectators in attendance was the first home game of the season, when Georgia State lost 78-81 to Georgia Tech. However, that does not mean attendance is where Hill and the program want it to be. It also does not mean that the same amount of people coming to the men’s team games at the GSU Sports Arena will come to the women’s games. Last season, men’s basketball had a home attendance record of 1,792 people against conference opponents. Their most attended game was also against Georgia Southern. A sellout game of 3864 people, in which, Georgia State would win 83-66. In the two home conference games it played, an average of 1,389 fans were in attendance, a 12 percent drop from last season excluding the Georgia Southern game. With seven home games left against conference teams, their attendance looks to remain consistent as well. The cancellation of doubleheaders for Georgia State’s basketball programs seems to have little effect on either teams’ attendance. It looks like the attendance will stay consistent this season for the remainder of the home games they have. Winning is a huge part of attendance and the men’s basketball team has been winning a lot in the past two seasons. They have had the highest winning percentage of any Division 1 college basketball team in the state of Georgia for the past two seasons. As the women’s basketball team rebuilds with a new coaching staff and system, and they’ve already matched their win total from last season just two weeks into January. Expect them to have a lot more support and a higher attendance record in the seasons to come.